They don’t write them like they used to. At least that seems to be the case when it comes to well-written fictional horse books. Although the first novel credited with having a horse as a protagonist was Anna Sewell’s Black Beauty in 1877, the most bountiful decades were the 1940s through the 1960s, when authors like Marguerite Henry, Walter Farley and C.W. 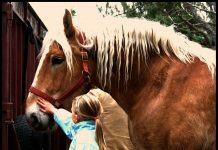 Anderson introduced horse loving readers to a stable of memorable horses like Misty of Chincoteague, the Black Stallion and Blaze. If you’re nostalgic for the books you read in your youth, or if you never experienced the grand adventures of horses like Smoky or ponies like Kipper, it’s time to start your own library. Here are some quick tips on how to wrangle up some classic horse books. First, decide if you want copies simply for your reading pleasure or as a valuable collection. Recent editions of perennial favorites such as Will James’ Smoky the Cow Horse are widely available in paperback for as little as a few dollars. These are mass-marketed editions aimed at school children. When sold as “used” they often have scribbles inside the cover or a few dog-eared pages. But that doesn’t detract from the pleasure of reading the tale. However, if you’re willing to invest more money, you can—with some luck—locate more coveted editions of the same book. For example, a quick online search revealed a near-perfect hardcover copy of a 1928 edition (the book was first published in 1926) for $2,500. Of course, this is one special book: The author personally signed it with an inscription to his best friend. Next, you’ll need to make a list of which books you want so you can begin your hunt. Do you want to round up all of the horse books written by Marguerite Henry (there were more than 20) or are you more eclectic, with tastes that range from Dorothy Lyons’ Dark Sunshine to Patsey Gray’s Horsepower? Once you’ve created your wish list, you can either haunt the halls of used book stores or search online. The benefit of using the Internet is having access to the inventories of thousands of used book dealers, thanks to the search engines of several databases. Two of the most popular are Advanced Book Exchange (www.abebooks.com) and Alibris (www.alibris.com). Fortunately, reputable, established used book sellers adhere to the grading guidelines of the Independent Online Booksellers Association (IOBA). That means it’s easy to compare various copies of the same book based on their condition. Used books will be rated from very fine or “mint” condition to “reading copy only”, meaning it’s significantly marred to the point that it’s worthwhile only as a complete text. The IOBA descriptions are quite reliable, which can make bidding on used horse books via online auction sites a little risky, as they’re often offered by private, non-professional booksellers. Finally, once you’ve begun your horse library, corral them with some sturdy bookends. Always store your vintage books standing up. That helps protect the spine from further wear and keeps the boards (the hard covers) from warping. And if you’re lucky enough to obtain a book with a dust jacket, don’t remove it. Original dust jackets, even if they’re a bit tattered, add to a book’s value. Much like a day sheet helps your horse stay neat and clean, a dust jacket will help preserve the appearance of your beloved books. Need some inspiration to start your collection? Check our list of 30 of the greatest horse books of all time. Oh no, after reading this I’m afraid I’m going to be surfing the Internet for old horse books. Why didn’t I keep them when I had them as a kid??? Smoky the Cow Horse is such an awesome book! And I’ve never met a kid who didn’t like Billy and Blaze. These are some great reads! I have read some of the books this article mentioned. I loved them! Horse books are my fav! Those were the days. Reading horse books and nothing else mattered. I love this idea! I actually went hunting for a copy of a book that I received as a gift from a friend when I was a young girl who had taken a trip back to her home in England. I loaned it to a school teacher at West Rouge Pulic School in West Hill Ontario. I’ll never forget her name since this book was my very first horse book and I was so proud of it. I asked almost on a daily basis for my book back and before I new it school was finished for the summer and my book was gone forever!! My eagerness to replace this at 58 years old paid off when I found a used copy on the internet and was delighted to receive a copy which was not too bad of shape.Although not my original it has a bit of use to it which is similar and now I can get that out of my mind. You have now inspired me to search for the whole collection of these books to have a complete set. Posting an on-going list of classic horse books here would help a lot of people who have never read some of them. I once read a book about a horse who was stolen by Indians and went through several owners before being bought by a man who gives him to his new wife who is his original owner. I believe the horse’s name is Omar.